Our PFW1810 bags measure 8" x 10" and include a suffocation warning prominently displayed in three languages. These self-sealing bags are made from 1.5 mil thick poly barrier material and have a resealable adhesive. Anti-static strip makes for easy loading of toys, textiles, instruction manuals, and more. Meets Amazon FBA requirements. 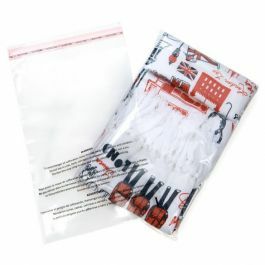 Using pre-printed Suffocation Warning Bags are an easy way to make your product consumer-ready for diverse markets. These 8" x 10" poly flap bags have imprinted suffocation warnings in English, Spanish, and French and feature the highest standard of clarity available. An anti-static adhesive allows for efficient, easy loading of your products. Ideal for packaging toys, baby products, instruction manuals for appliances, electronics, and more. A resealable adhesive is located on the flap of the bag. These bags meet requirements for Fulfillment by Amazon (FBA) services. Inner Dimensions: 8" x 10"
Most popular use is for packaging clothing and products for children.